I have just finished reading a book called John Hobbs 1800-1883 – Wesleyan Missionary to the Ngapuhu Tribe of Northern New Zealand by Tolla Williment (a descendant of John Hobbs). The Rev John Hobbs aged about 29. John Hobbs came to New Zealand in the late 1820’s to work on the first Wesleyan mission station situated at Whangaroa. 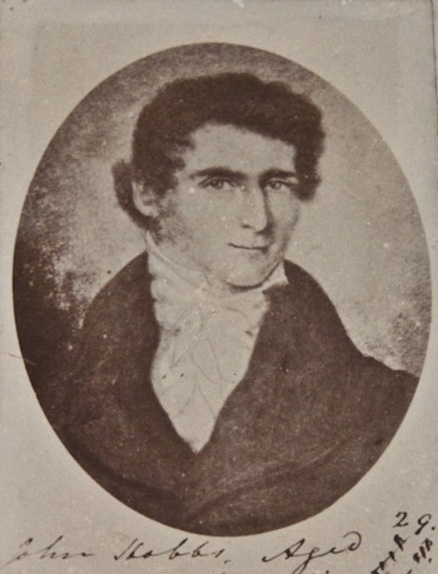 Following its destruction by stragglers from Hongi Hika’s war party in 1827, he successfully spearheaded the re-establishment of the mission in Hokianga in 1828. In 1833 he left for Tonga only after 5 years to return to the Hokianga by early 1838 where he remained until his retirement in 1855 when he moved to Auckland. One of his daughters Marianne, married a Rev Gitto’s who himself would have a lot to do with the area in and around the Northern Kaipara and also the Stanaway family. My point my interest in John Hobbs was mainly around the time he returned from Tonga and settled in Hokianga we believe that John James Stanaway came to the Hokianga shortly after Hobbs and that they would have known each other. From the 1846 Clendon Census we note that it had Rev John Hobbs with 9 children. We know that the Hobbs had a total of 10 children in all. Their sixth child, George, had died in 1838, and the tenth child was born after 1847, thus leaving them just 8 of their own children at the time of the census, not the 9 as listed. We suspected that Mary Ann Stanaway may well have been the ninth child listed as she does not appear on the same census with her father. The above book does not mention another child living with the family at any point. Had Mary been living with th Hobbs family since her arrival in about 1839 she would have been about 6 years old at the time of the census. It could be that she was with another family or that the census was not carried out-door to door and more from hearsay. So we could say we are back to square one on this issue and without checking every family on the census we may never know where Mary was at this time. In the mean time I will try to make contact with the author or her descendants in an effort to see it Mary was with the Hobbs family for the early period of her life. This entry was posted in Uncategorized and tagged Clendon Census, Family Connections, Hokianga, John Hobbs, Kaipara, Mary Ann Stanaway, Stanaway, Tolla Williment on March 2, 2016 by gregorypaulskinner.